Mairangi Players are a community theatre group that has been at the leading edge of the North Shore theatre scene in Auckland since 1952. Today we own and operate our own 70-seat theatre - TheatreWorks - in Birkenhead. The club usually puts on four productions per year, two family productions and two adult works. Membership entitles members to discounted tickets to club productions, regular newsletters detailing all Mairangi Players theatre events and auditions, access to our extensive costume and formal wardrobe and acting fees. Our extensive wardrobe and props departments, and theatre itself, can be hired by both members and non-members at reasonable rates. Our drama classes are unique in giving young people real access to youth oriented productions at the theatre, usually directed and staffed by members of our own thriving youth membership. Find out more here. 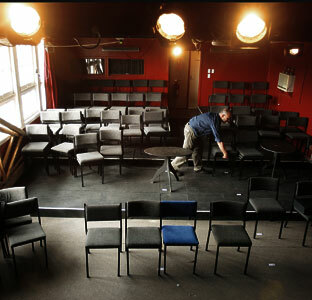 The theatre is available for hire when not in use for our own productions. Rates are very reasonable - please email us at for availability and rates. Hire costumes or props from us!